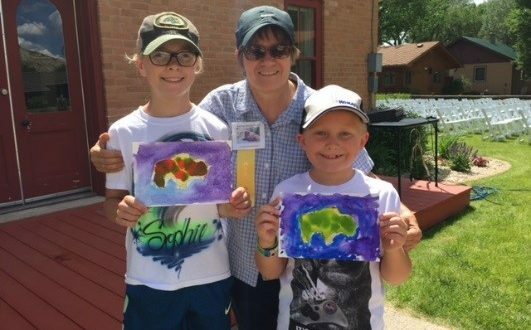 Experience a creative vacation in Medora this summer! 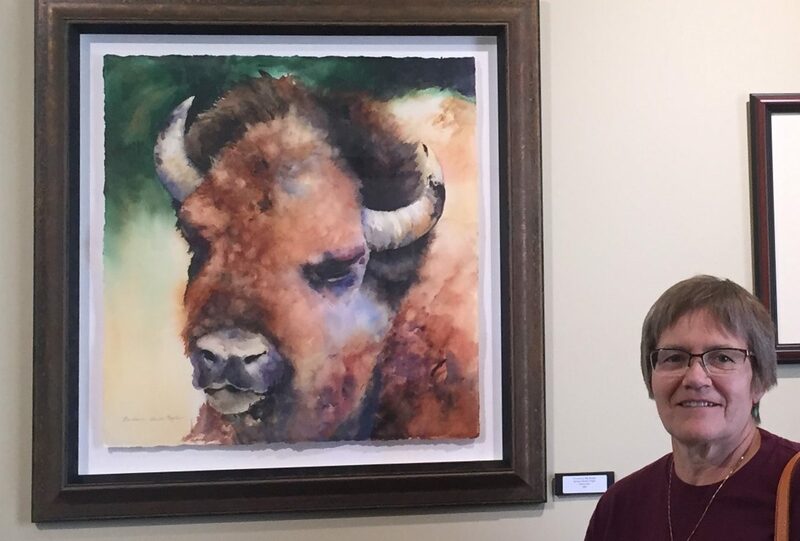 Join Barbara Benda Nagle, professional artist and instructor as she teaches “Spur Your Inner Artist with Drawing and Watercolor” workshop June 4 – 7. A native of Wahpeton, ND, Barbara excels in simplifying art concepts so all levels of learners may succeed. This workshop takes place in the state-of-the-art Bill and Jane Marcil Life Skills Center in Medora. Class size is limited – the first 15 registrants will secure a spot. Payment options vary from workshop only to the popular Stay and Paint package, which includes lodging at the historic Rough Rider Hotel. For more details, please visit our event listing here or call 701-610-9529. Meet our artist in residence, Char-Marie Flood! If you’ve never been to Medora or haven’t visited in a long time, you may wonder if Medora is just a place for cowboys and musical enthusiasts. Cowboys and music lovers abound—it’s true—and they can be seen daily sauntering through town enjoying the view from the saddle, or reveling in the rhythms of the famous Medora Musical. But for those of you with a wide range of interests, Medora offers a lot to visitors who take the time to explore—more so now than ever before. 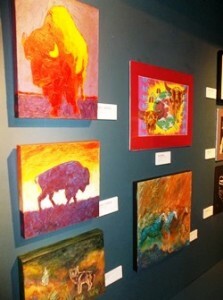 A surprising aspect that visitors to Medora are discovering is the artwork to be found throughout town. 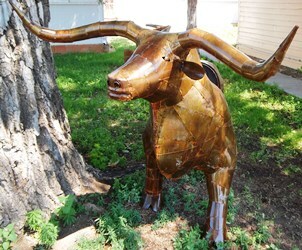 Some examples of art in Medora are obvious, and others are more subtle. 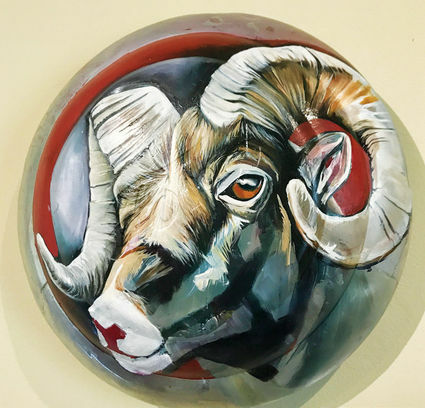 You will discover artwork infused with the flavor of the Old West, along with more modern works inspired by nature that add to the visual interest of Medora. Enjoy these examples and many more when you are here, and feel free to share your Medora art discoveries with us as you find them! Check out www.medora.com/events for special art shows and feature artist events throughout the spring, summer and fall seasons. Guests can catch an entertaining show in the Old Town Hall Theater every day of the week (“A Teddy Roosevelt Salute to Medora” Mondays through Fridays at 4pm, and the “4M Revue” Saturdays and Sundays at 1pm and 4pm). 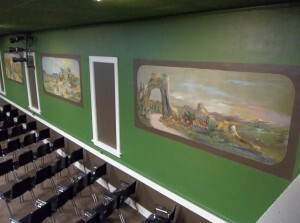 However, stop in early to take in original murals on the interior walls of the theater. The Old Town Hall was built in 1924, and traveling artist Joe Breckenridge created the murals in 1936. He then returned in 1960 to touch up his work. A much newer addition to the artistic side of Medora, these wind sculptures were added in the past month. Five unique metal sculptures, hovering like trees above your head, spin and swirl in the North Dakota breeze. These sculptures were gifted by the John Andrist family of Crosby, North Dakota, and are located at the Harold Schafer Heritage Center Patio Lawn, adjacent to the historic Von Hoffman house lawn. 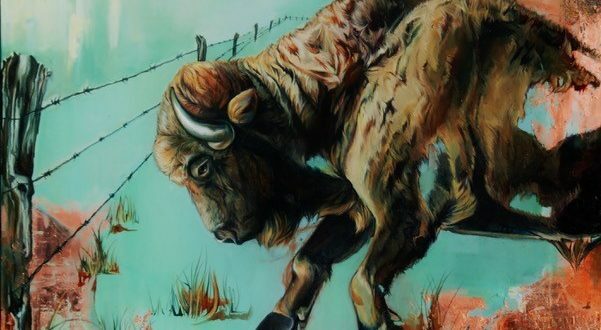 Along with its fascinating permanent exhibits, The North Dakota Cowboy Hall of Fame is currently featuring this traveling exhibit of art. The gallery pieces speak to the very purpose of the museum: honoring the heritage of Native American, Ranching, and Rodeo culture. Take in this colorful exhibit, and while you’re visiting the museum, appreciate the artwork on display in the permanent exhibits such as the beaded Native American moccasins shown here, and the bronze pieces adorning the outside of the building by North Dakota sculptor Arnie Addicott. 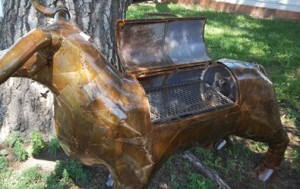 I had to look twice – no, that’s not a longhorn grazing on the lawn of a local merchant’s business, it is in fact a usable grill! This creative cooker and a colorful herd of mini-horses add to the color and fun you will experience walking the streets of Medora. “Cowboy Lyle” may wear boots and a cowboy hat, but he’s a photographer at heart. Lyle’s photography features wildlife and scenery from the North Dakota Badlands. 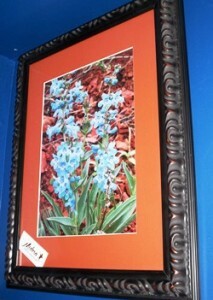 You’ll find his work displayed in frames and as greeting cards in various locations throughout Medora. And if you’d like to get a shot of Lyle himself (and maybe even an autograph! ), you’ll likely find him outside the Badlands Pizza Parlor in downtown Medora. When the Rough Riders Hotel Dining room was refurbished and renamed Theodore’s Dining Room in 2009, the interior underwent a total transformation. One of the beautiful additions to the dining room is a set of identical stained glass windows, placed back to back and looking out onto the dining room on one side, and TR’s Tavern on the other. The windows were gifted by Jim and Joanne Kack, who purchased the pieces from a Minnesota stained glass collector in the mid 1980s. 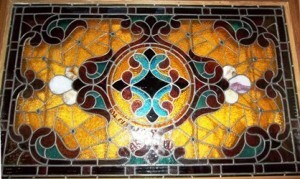 The glass was thought to have originated from the Church of the Redeemer Episcopal Church in Superior, Wisconsin, which opened in January 1892. Two similar pieces given by the Kacks are also displayed above the front desk of the adjacent Rough Riders Hotel in Medora.